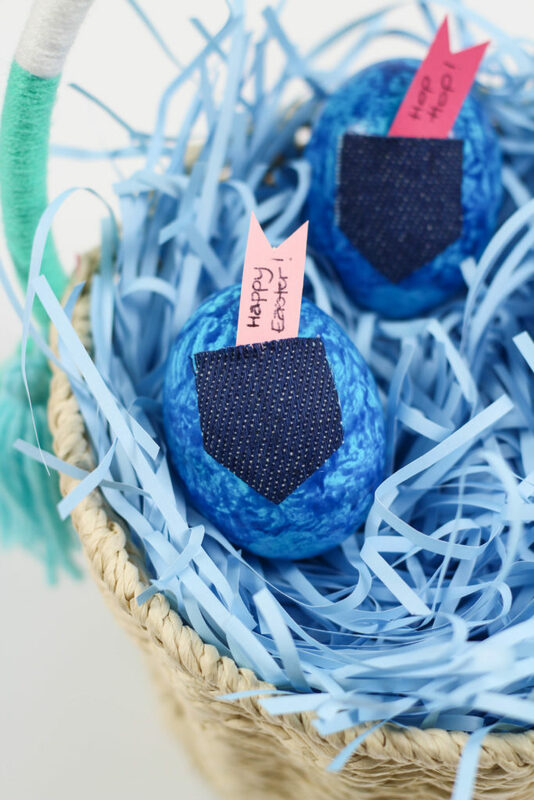 They are simple to make and a fun spin on gifting some extra cash to the lucky egg hunters that stumble upon them! 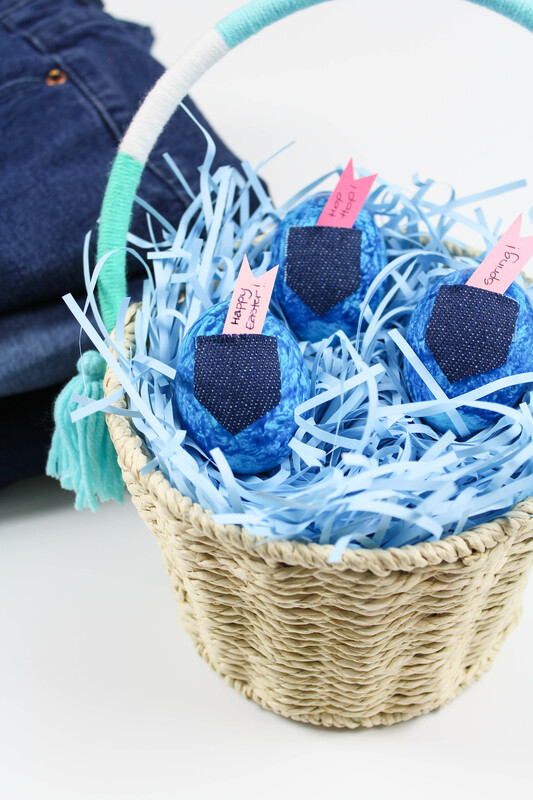 You only need a few simple supplies to pull these DIY jean Easter eggs together and have your eggs end up on the best dressed list this Easter. If you are using liquid egg dye, follow the directions on the package to prepare your dye. If you are using acrylic paint, pour some paint into a container and add a bit of water to give it less thick consistency. You want the result to be a tiny bit thicker than watercolor paint. 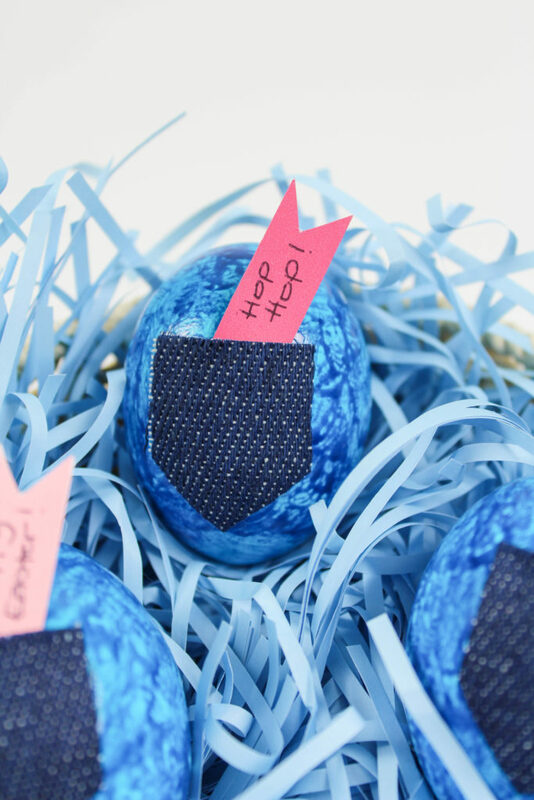 Using a small paintbrush, begin applying the paint or dye to the egg, swirling in a circular motion from side to side. You don’t want to coat the entire egg evenly. You want the effect to look brushed on and “acid washed” kind of like your favorite pair of jeans. Inconsistency is key and varied color, like dark and light spots, is what you’re aiming for. Allow the middle section of the egg to dry completely and then repeat the same steps to the top and bottom of the egg. Depending on your dye or paint, you will need to add additional coats. This will also give the egg and the color a bit more dimension and texture, so a few coats is actually good! Once you have achieved the look you want, allow the eggs to dry completely. Overnight is best. Once dry, cut little pocket shapes out of your jean fabric. 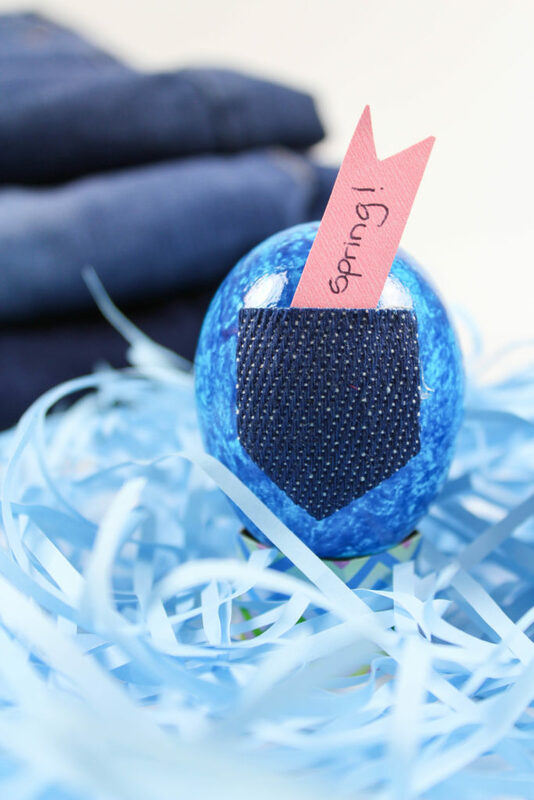 Attach the tiny pockets onto the front of your painted eggs using hot glue. Remember not to glue the top of your pockets so that you can fill them with dollars or messages! 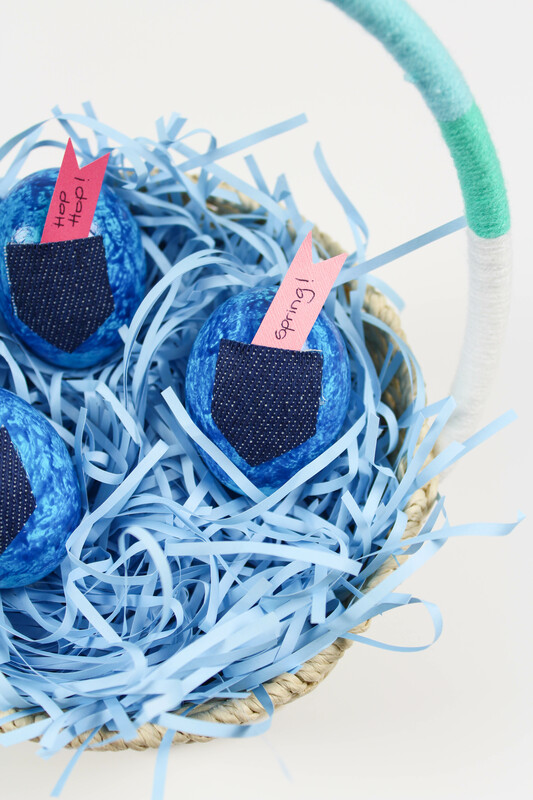 Fill the pockets with fun things like money, sticks of gum, mini Easter messages, or even names to use as place cards on your Easter brunch table! 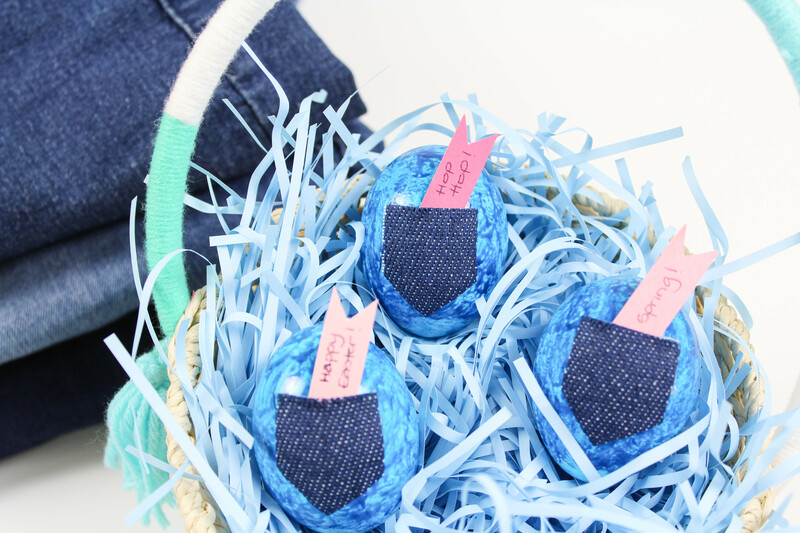 These DIY jean Easter eggs are so cute, easy to make, and a fun twist on your traditional eggs. 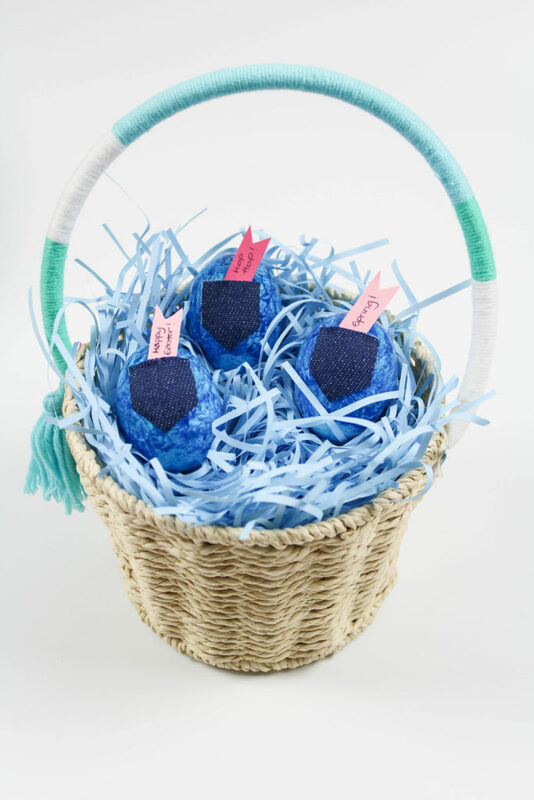 And just like your favorite, worn in, pair of jeans, who wouldn’t want one of these little guys in their Easter basket this year?